Heat the oven to 170C. Soak the golden raisins in the water preferably overnight but an hour is adequate. Use a hand blender to puree the golden raisins until it looks like a smooth pulp. Use an electric mixer and beat the aquafaba [chickpea water] until it is stiff and looks like a meringue. In a large bowl place the ground almonds, lemon juice, citrus zest, corn flour or rice flour and vanilla. Mix well and then add the golden raisin pulp. Mix and finally fold in the aqua faba. Mix well. Then use your hands to bring the dough together. Knead it slightly on a work surface dusted with a mix of ground almonds and cornflour or rice flour [which ever you are using]. Spray the baking tray with some cooking spray. Cover a baking try with rice paper. 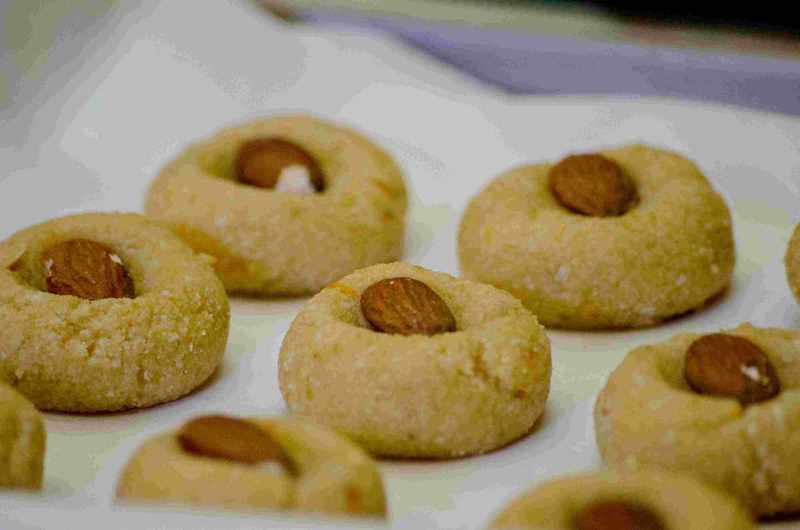 Shape small balls of the almond mixture with your hands. Place the almond balls on the rice paper on the baking sheet. Place a whole almond on top of each cookie. Bake for 15 minutes or until they are golden and start to look slightly crisp. Allow them to cool completely, preferably overnight before removing them for the baking sheet. If you like a harder consistency allow them to bake for a further 5 minutes. Tip: If you do not have rice paper use baking paper and spray it with cooking spray. They freeze well and keep for up to 3 months.